Thank you to our experienced representatives who have contributed towards our success throughout the 50 years. 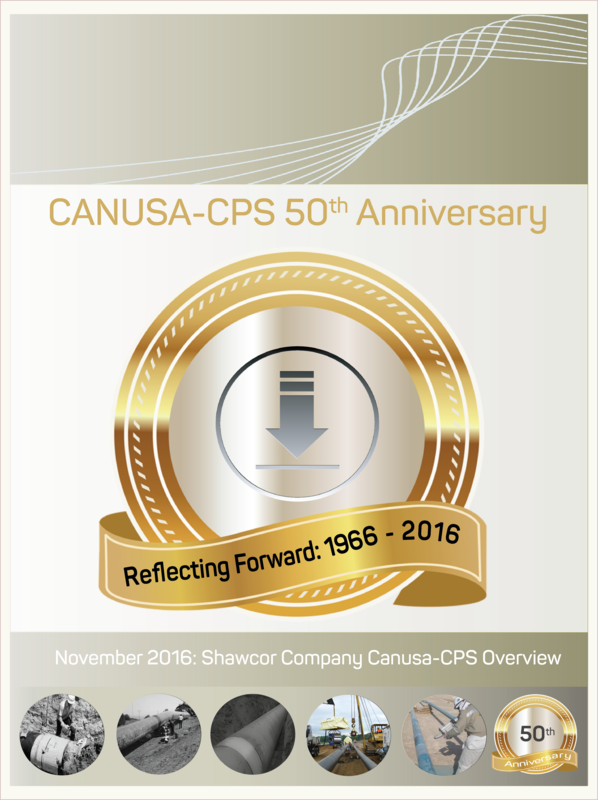 Since 1966, Canusa-CPS, a Shawcor company, has been a global leading developer and manufacturer of specialty pipeline coatings for the sealing and corrosion protection of pipeline joints and other substrates. And as oil and gas continues to be sourced from offshore fields, offshore pipelines are growing in number and length and are being laid deeper, with increasingly high operating temperatures. In 1966, Canusa-CPS was initiated in Canada and then expanded to the United States. In the 1980’s, the company was mainly concentrated in North America. In the 1990’s, Canusa-CPS experienced an aggressive global expansion with a major focus on the introduction of products and services to meet local market requirements. Such standards were met by responding to customer specifications and needs, partnership agreements and international certifications such as ISO, EN , CSA…etc. In 2000’s, Canusa-CPS continued to grow to become the world’s leading provider of field-applied coating systems and services. Focus shifted to higher performing products to meet the stringent customer demands and requirements associated with a growing number of pipelines requiring advanced and high temperature coating performance. This included a specific focus on the special requirements of the global offshore market, where the company became the dominant supplier of products and services, having supplied to the world’s most advanced and prestigious deepwater pipelines globally. From 2011 onward, Canusa-CPS continued to lead the way in terms of innovation and advancement of field coating technologies with the introduction of automation equipment. The company’s patented IntelliCOAT system was launched to compliment the wide range of advanced products, such as its world leading Factory Grade 3LPE and 3LPP coating systems which provide equivalent performance to 3LPE/3LPP linepipe coatings and which allow for consistent end-to-end coating performance when combined with Shawcor’s leading 3LPE/3LPP coatings. “Thank you to our experienced representatives who have contributed towards our success throughout the years. We would also like to thank them for reaching out to our customers – responding to their day-to-day business activities with flexibility, dedication and ability to provide the right solutions all the time” said Ron Dunn, Senior Vice President - Research & Development and Operations, Shawcor. The introduction of new technologies to meet emerging market needs has been a passion for Canusa-CPS over the years. This has led to significant evolution of the company’s product range and to the vast number of solutions that the company has available today. When combined with our offices in Canada, the United States, Europe, the Middle-East and Asia Pacific, and our unparalleled global field service team, we can deliver the best solution for any pipeline regardless of location and of the required performance. Today, Shawcor’s Canusa-CPS products have over two dozen patents filed, granted and pending on various products and technologies related to pipeline joint projection and application methods. As a solution provider with fully capable field service engineering, our innovative pipe coating systems deliver maximum protection in the most extreme environmental conditions. Our broad product lines service the following major market segments: oil and gas offshore, oil and gas onshore, district heating and cooling, water pipelines, repair and rehabilitation and industrial infrastructure and supports. Moving forward, Shawcor will continue to focus on advancing the pipeline coatings industry, not only by continuing to introduce new coatings to meet emerging market needs and to promote consistent coating performance over entire pipeline networks as we have always done, but also by advancing the industry in terms of the availability of data rich solutions and continuing to provide a greater degree of real time traceability and integrity management of field operations for its customers. “The pipeline industry continues to demand a greater degree of certainty, traceability and improved asset integrity. Through its Canusa-CPS brand of products and services, Shawcor will continue to deliver innovative solutions to increase the integrity of pipelines with an ever increasing focus on advanced corrosion protection, automation for consistency, productivity and safety and through the availability of data from field operations in real time to provide greater traceability for our customers.” said Pascal Laferriere, General Manager, Canusa-CPS, Shawcor Pipeline Performance. Download the full presentation. This presentation introduces you to Shawcor company Canusa-CPS since it's establishment in 1966. The paper demonstrates a timeline of technology platforms that were developed throughout the years - from 1966-2016 and our look into the future of field-applied coating solutions.